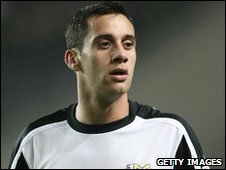 MK Dons striker Sam Baldock has signed a new three-and-a-half year deal to keep him at the club until 2013. The 20-year-old, who came up through the academy, has scored 21 goals in 62 appearances for the Dons. "I want to grow with this club. Everything about it says Championship, if not Premiership," Baldock told the club's website. "It's great the manager and the chairman have shown so much faith in me and want to make me a part of it." Under boss Paul Ince, Baldock has scored eight goals in just 10 games, scoring 13 overall in his breakthrough season. "I'm over the moon. Securing a player of Sam's potential is a massive signing for the club and a clear indication of where we want to go in the long-term," said Ince.